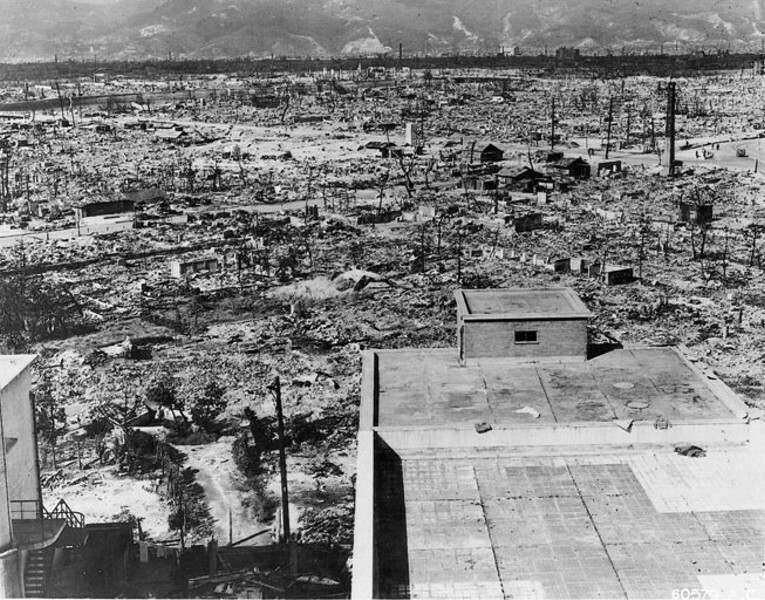 Public domain Hiroshima, Japan, 1945, after its destruction by the first of only two atomic bombs used in warfare. This country was built on the two great evils of genocide (of indigenous people) and slavery (of Africans). Lynching was a fact of Southern life less than 100 years ago, while "progressive" Theodore Roosevelt got away with saying, "I don't go so far as to think the only good Indians are dead Indians, but I believe nine out of ten are." Today we have an African-American President and (taking a local example) the Yurok and Karuk tribes are leading players in undamming the Klamath River. The U.S. murder rate is 1/30 what it was in Middle Ages Europe. According to the U.S. Department of Justice, in 1980, it was 10.2 per 100,000 people annually; by 2010, the U.S. murder rate had fallen to 4.7 per 100,000. In 1900, infectious diseases caused half of all deaths in the U.S.; today it's less than 3 percent. The average lifespan of a baby born here in 1900 was 47; today it's 77, according to University of California Berkley Department of Demography. And Oxford University economist Max Roser (author of Our World in Data) says the global population living in what the World Health Organization defines as "extreme poverty" decreased from 44 to 10 percent between 1981 and 2015. War deaths have massively declined. The first half of the twentieth century saw tens of millions of world war deaths; by the second half, that was down to millions in superpower "proxy wars"; in this century, our worst wars, such as in Iraq and Syria, kill hundreds of thousands. Nuclear weapons haven't been used since 1945. In contrast with the good old days, we expect that the great powers will settle their differences peaceably. Despite the brutally high, racially-biased incarceration rates in this country, we've come a long way from old-time punishment. Here's how Assyrian king Ashurnasirpal (884-859 BC) dealt with rebels: "I flayed all the chiefs who had revolted ... Some I impaled upon the pillar on stakes ... Some I cut off their noses, ears and fingers; of many I put out their eyes ..."
The land stewardship of "noble savages," as philosopher Jean-Jacques Rousseau's called our indigenous ancestors, is sometimes compared to our ravaging of the environment, but those so-called gentle people hunted mammoths, dodos and moas to extinction, turned the Valley of Mexico into a dustbowl and chopped down all the trees in Iceland and on Easter Island. Whence our predilection to romanticize the past and condemn the present? Two (of many) reasons: our 24/7 "if it bleeds, it leads" news feeds keep death and destruction in our awareness; and we're genetically programmed to pay more attention to negative than to positive data (better to assume that rustling in the tall grass is a sabertooth tiger, even if it turns out to be the wind). Of course we've got overwhelming challenges: climate change, overpopulation, environmental devastation, resource scarcity, ocean acidification, a billion people still living in poverty, instability in the Middle East and elsewhere. But talk of those good old days is a canard. On average, humans have never been healthier, more prosperous, long-lived, peaceful or democratic. As political philosopher Leif Wenar put it, "The world now is a thoroughly awful place compared with what it should be. But not compared with what it was." Barry Evans (barryevans9@yahoo.com) never thought he'd see gay marriage become the law of the land in his lifetime.